2018 has been a rollercoaster! Just a little over a year ago, I sat where I’m sitting now having penned my first novel. It still needed a lot of work, but after an exhausting few months, I had done the impossible. The story that bubbled and boiled for so long was finally here and I had no plans on resting until I shared it with the world. I submitted it to various publishers and literary agents, but after three months and dozens of template rejection emails, I decided to self-publish. I read every blog and article I could find and after putting together a marketing plan, I unleashed my story into the world. It did surprisingly well for the first few weeks, before ultimately crashing and burning. That was one of the many reactions I received after I made the conscious decision to take writing seriously. I can’t blame anyone for reacting like that – prior to September 2017, I had never once openly expressed an interest in writing. It was always something I’d considered doing when I had more time. When my children are more settled in school, when things get quieter in work, when the latest season of Game of Thrones is over. The list of reasons not to write grew longer and longer. Then, in September 2017 something happened. For years I juggled parenthood, working and building my app development side-project. After one particular project went south, a moment of clarity struck me when I asked myself what I wanted to do. Did I want to spend every spare hour continuing to build and develop apps? I thought about that question over and over until I came to a realisation. Deep down, app development was nothing more than a means to an end. I wanted to grow my app portfolio for no other reason than to increase my income. That would then allow me to quit my job and focus on what I really wanted to do – write. From that moment, an idea crystallised. Rather than spending what little free time I had doing something that I may have been good at but realistically, had no interest in, I decided to start writing. The transition wasn’t easy, but I did have a head start. Prior to forming my first app development company two years previously, I had written roughly thirty pages of a story based on a vivid dream I had. I dusted this story off, re-read and edited it and then I wrote a single sentence. From that sentence a paragraph was born, followed by an entire chapter. I became possessed, spending every (extremely rare) moment of peace and quiet dragging a story out of me. It was something I had been thinking about for years, something that I had torn apart and put back together so many times, that it felt more realistic than the real world. Determined not to rest until I had this story completed, I worked furiously around the clock, eventually finishing it two hours before midnight on New Year’s Eve 2017. The sense of satisfaction from drafting a 100,000-word story struck me like a hammer. It almost felt like an out-of-body experience as I read through it. Through sheer force of will, I had ignored every desire to relax, laze about and waste my time and instead, had built an entire world from scratch. It isn’t easy and there are times when the last thing in the world I want to do is write. I sometimes think back to September 2017 and wonder what things would have been like if I didn’t have that epiphany. There would have been no self-publishing journey, no countless hours of bashing away at a keyboard, no publishing deal and certainly no Big Red. I could easily have kept on developing apps and who knows where I’d be with that now. The most important thing is that I’m happy. I’m glad I made that decision. I’m glad I spent months sacrificing my free time to write Big Red. I’m glad I have the opportunity to be a writer. Like most of my writing projects, Big Red started as a dream. I’ve always had an overactive imagination, which is something that’s followed me into sleep. It’s rare that I don’t have vivid dreams (or nightmares) that I can easily recount the following morning. When I woke up, I wrote roughly two pages describing what I had dreamt about. It wasn’t much and I didn’t know it at the time, but that became the basis for the first two chapters of Big Red. I can still remember seeing rows upon rows of fold-out beds with soldiers laid out on them, screaming and howling out in pain and agony. Dressed in an army uniform myself, I walked past them before looking up and seeing a swirling, crisp image of the planet Mars. To say this dream impacted me would be an understatement. I played around with the idea for months, trying to figure out the context. What were those soldiers screaming about? Why Mars? While doing day-to-day errands the idea played on my mind. I created characters and their backgrounds. I read up on interstellar colonisation and exploration and kept track of the growing attempts to put a manned crew on Mars. I considered setting Big Red in the future, at a time when we had the mainstream technology to do the things that so many people dream of. But that didn’t feel right. I thought back to my years in primary school. One of my teachers once quipped his belief that our current level of technology is far more advanced than most people realise. In a two-minute ramble, he told us that, in his opinion, technology is released to the masses decades after being developed behind the scenes by various shadowy government organisations. Was he wrong? I have no idea. I enjoy reading conspiracy theories with an open mind, but I never bought into the idea that some international cabal was trying to control us. Still, I took his idea and looked at Big Red through his lens. What if (in 2018/2019) humanity already had the ability to travel between the stars and establish colonies? What if those colonies have been there for decades? What would that be like? And with that thought, the background story for Big Red was born. It took further research to develop and flesh it out. I wanted the history of the colonies to be based (as much as possible) on real life events and fears, even if that history wasn’t directly dealt with in Big Red. Being a bit of a history buff, I remembered reading about the Nazis V1 and V2 rocket programs during WW2 and the fear and terror this newfound technology brought. I studied up on it and read about how the Russians and Americans both rounded up these Nazi scientists post war and quietly put them to work. Using that and the still ongoing fascination with the theory that Hitler escaped as jump-off points, I created a background where the last remnants of the third Reich used their advanced technology and escaped to Mars. Stories like that have been done before, but the events in Big Red don’t deal with this. Instead, it takes place decades after the Allies victoriously crush the Nazi threat (following the historically documented “1952 Washington UFO phenomena”) with their 1954 invasion of Mars. The characters in Big Red learn all this, shortly after realising they’ve been abducted. As fascinating as it is to them to learn about this alternate history, these events don’t impact them directly. The aftermath does. The simmering racial tensions between descendants of the Nazis, Mars-born Allied colonists and the Earth-born soldiers that protect and police them is a vital aspect to the overall story and one that brings dire consequences. To think, all of that started with a dream. I posted previously about the world-building involved in creating Big Red, giving some insight into where I got the ideas from and what inspired me. With just over sixty days to go until Big Red lands in a book shop near you, I wanted to dive a bit into the background, giving readers a better insight into the fictional back story and history. A lot of these events took place before the characters of Big Red arrived on Mars, but in a lot of ways these events shaped their surroundings and environment. So, here goes! As World War 2 drew to a close in Europe, Nazi scientists perfected a revolutionary new form of long-range interstellar travel. Having been used to establish secret research facilities on Mars in the 1930s, this was hailed by an increasingly deteriorating Hitler as a chance to turn the tide on the Allies. Hampering the Nazi leadership was the fact that this technology was based on unknown origins and couldn’t be operated to transport troops to any point on Earth. As the Russians advanced to the gates of Berlin, an increasing number of high-ranking party officials began to break with Hitler’s fantastical beliefs of a final victory and contemplated using this new technology as a chance to escape. 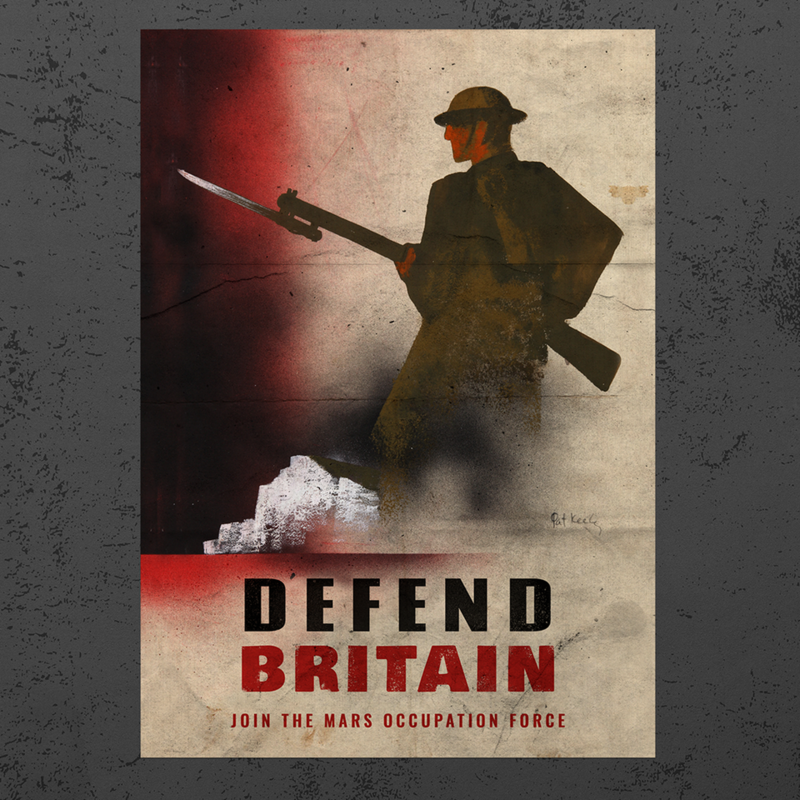 With the Russian forces emerging victorious in the brutal Battle of Berlin, the last remnants of the Third Reich escaped the slaughter and retreated to the only place the Allies couldn’t reach them – Mars. On Mars, the Nazis had long since established formal relations with the indigenous population dubbed “The Natives”. These Natives were an agrarian society, primarily living underground in subterranean communities. Although they had an awareness and even an understanding of technology, they had forsaken it to pursue a more idyllic life based on community, hard work and family. That’s all for this week, folks! In the next post, I’ll detail pivotal events in the Big Red story covering the (historically documented) 1947 Roswell UFO Incident, the 1952 Washington UFO incident and the 1952 Stalin note. These events together serve as a catalyst for the Allied response to German plans to stage a comeback and the 1954 Allied invasion of Mars (culminating in the oft-referenced “Battle of New Berlin”). Stay tuned and don’t forget – Big Red lands on the 14th May! Welcome to Part Two of the Big Red back story. This one picks up where the last one left off, so dive right in and enjoy! The first concrete evidence that the Nazis had escaped the war came about in 1947, just outside of Roswell, New Mexico. In the wreckage of a crashed spaceship, Airforce investigators found the bodies of two human pilots- later identified as high-ranking SS members - thought to have died on the Eastern Front. This prompted alarm within military and government circles that an invasion from technologically superior Nazi forces was imminent. In response, President Truman ordered the creation of a covert organisation known as ‘Majestic 12’. Given wide-ranging powers, this group began reverse engineering the downed spacecraft, directing government policy and overseeing a massive public disinformation campaign to cover up the truth. For the remainder of the 1940s, Nazi incursions into Allied airspace continued, although no direct hostile actions were taken by the aggressors. This led many within the Truman administration and Majestic 12 to believe that these fly-bys were either shows of strength or meant to test the capabilities of the enemy’s fighter-sized craft. By early 1950, the construction of Earth’s first interstellar fleet of ships was midway under construction when Majestic 12 reported that the Third Reich leadership had opened negotiations with the USSR. Unwilling to admit to Stalin about the existence of the new fleet under construction, President Truman secretly ordered Majestic 12 to open a back channel with the exiled German forces to learn of their intentions. To buy time, the President ordered these unofficial talks to be dragged out for as long as possible, while Majestic 12 stepped up their efforts in building the new interstellar fleet. These negotiations came to a head in March 1952 when Stalin made public his infamous ‘Stalin note’. This note called for a reunified Germany, free elections and the subsequent withdrawal of all Allied forces. The US and their allies publicly rejected the Stalin note, seeing it as the first possible step in a Nazi attempt to return to Germany from exile and re-establish a militarised National Socialist state. Infuriated, the Third Reich leadership ordered an aggressive show of force, culminating in the 1952 UFO Washington Incident. Between the period of 12th – 29th July 1952, there were multiple sightings of UFO’s over America’s capital (including the White House). Determined not to back down, President Truman opened secret negotiations with Stalin and confirmed the existence of an American interstellar fleet of ships. After a series of long drawn out negotiations, the two sides agreed to form a united front against Nazi aggression and began planning an invasion of Mars. 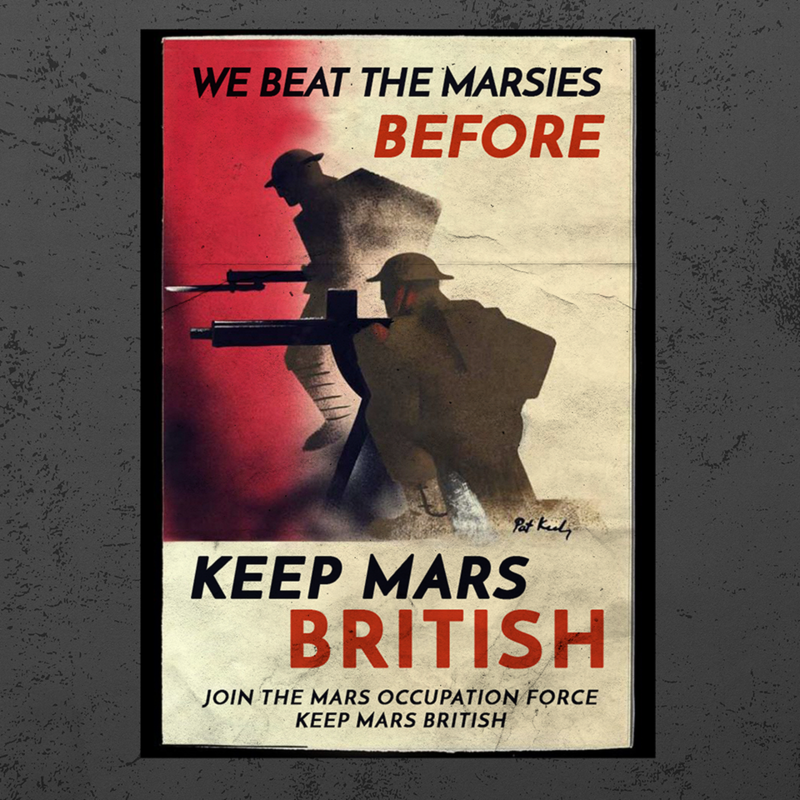 Despite mutual shows of good faith, neither side could agree on the make up or composition of the ground forces needed to conquer the German colonies on Mars. Stalin feared a blow to his prestige if it ever became public that American forces were victorious in Earth’s first interstellar war, while Truman worried about a Soviet presence on Mars once hostilities ceased. As a compromise, it was agreed that although the fleet would remain nominally under US control and both sides would commit support personnel and military attachés, the necessary manpower would need to come from third parties. Both sides reluctantly agreed to a joint British-French task force. This new group would be known as the Mars Expeditionary Force (MEF). In early 1953, the Mars Expeditionary Force set off on its mission and arrived on Mars in March 1954. Although the initial landing of MEF soldiers and supplies went according to plan, the fleet was practically annihilated in a series of daring suicide attacks by Nazi spacecraft. These actions left the MEF soldiers effectively cut off from re-supply or escape and forced them into a do-or-die action to seize the German colonies. The Battle for Mars had begun. I have some announcements coming up to do with Big Red’s launch on 14th May, so stay tuned!